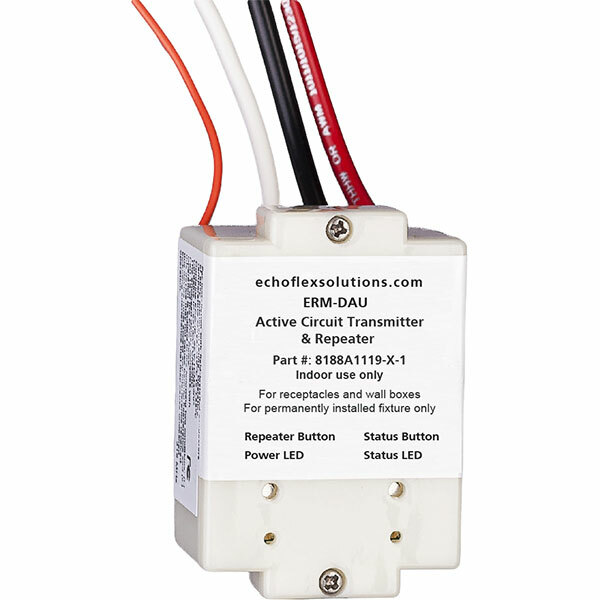 The Echoflex Active Circuit Transmitter ERM-DA indicates when an electrical 120V to 277V circuit is active, transmitting an EnOcean standard occupancy profile telegram. The state of the monitored circuit can be used to switch or trigger remote events and retrofit applications will benefit from the elimination of extra wiring. Used in a hospitality application, existing key card systems activate circuits based on suite occupancy. Using the active circuit repeater with these systems allows the facility to gain control over other electrical loads. Suite vacancy can de-energize plugin appliances like televisions or turn lights off, wired in systems such as window blinds can retract to a preset reducing solar and infrared radiation into the suite. The ERM-DA can also be used as a repeater - repeating EnOcean telegrams to improve communication reliability or to increase a transmitter's range. When enabled, the ERM-DA will repeat all EnOcean telegrams that are received. The ERM-DA supports both single and dual hop EnOcean repeating. Single hop repeating allows a telegram to be repeated only once; dual hop repeating allows a telegram to be repeated twice. The ERM-DA is now available in a low voltage 24VAC/DC version. Available in 902 or 868MHz.